(TibetanReview.net, Jun23, 2018) – A theatre in Nepal’s capital Kathmandu was forced to stop two shows of a play depicting the travails of the Tibetan refugees in the country and in India following a telephonic warning from the country’s Ministry of Foreign Affairs (MoFA), reported Record Nepal Jun 21. The call from the MoFA was stated to have alleged that the play was against Nepal’s ‘one China policy’ of not allowing any presumable criticism of China or its leadership on the Tibet issue. The play had begun staging from May 31 and was scheduled to continue till Jun 14. However on Jun 8, the board of Shilpee Theatre, Kathmandu, decided to shut the play after its artistic director Ghimire Yubaraj reported to the play’s director Loonibha Tuladhar that he had received the above warnings from the MoFA. Tuladhar initially took a defiant stance on the issue, with the result that Shilpee had to allow the play to continue for two more days on the condition that it be not promoted on social media and other media outlets. 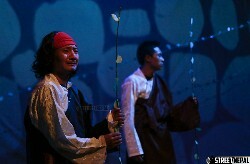 However, worried about the safety of the cast and crew, Tuladhar had to later stop the play on a prompting by Yubaraj. It was thus that on Jun 11, a week ahead of Prime Minister KP Sharma Oli’s scheduled visit to China, Shilpee Theatre canceled two shows of Kora. The report said Tuladhar was initially reluctant to go public with the story because she assumed that the future of Shilpee Theatre was at stake. She also felt that the news of intimidation would heighten the existing “sensitivity” of directors away from any topic that would be disliked by the people in power. However, after a few days she collected herself and was willing to speak up on record, the report said. The report also said Shilpee had initially green-signaled Kora, but felt the need to stop the play when an acquaintance from MoFA called, saying that the Nepali government was resolute in the one China policy. On the other hand, the report also cited Ram Babu Dhakal, the assistant spokesperson for MoFA, as denying that the Ministry had issued threats. Kora is the title of a book of poems on the travail of exile Tibetans written by India-based Tibetan poet and independence activist Tenzin Tsundue. Shilpee Theatre has done plays in the past that touched on political themes, apparently without attracting significant reprisal. It has been a champion of promoting theatre in the various mother tongues of Nepal and recently completed a Tamang theatre festival, the report said.